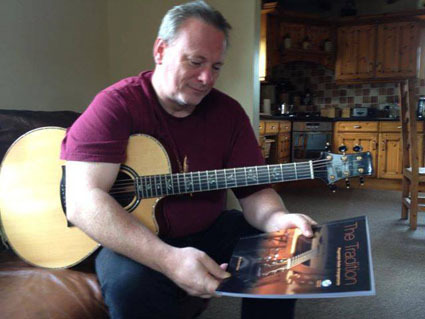 Tony McManus With 'The Tradition' Acoustic Guitar Book! Tony McManus With ‘The Tradition’ Acoustic Guitar Book! I was totally bowled over by this photo – this is Tony McManus, one of the world’s greatest fingerstyle guitar players (and one of my biggest influences), checking out my acoustic guitar book and CD ‘The Tradition’. Many thanks to Mickey Murphy for taking the photo! Tony and Mickey went on to perform a fantastic version of Black is the Colour from The Tradition on BBC Radio!